There’s something endearing about Cotacachi, but what that something is, is far from definitive. My husband, Kim, and I each have our own reasons for loving this little mountain town we’ve called home for almost two years. Kim feels the people of Cotacachi make it special. He enjoys leisurely, morning walks into town and loves to stop along the way and chat with shopkeepers. It’s not unusual to find him seated on a park bench chatting with locals. Invariably, men come up to him to shake his hand and elderly ladies often stop to give him a hug. I’m always surprised by how many people know him. On Sunday mornings he rises early to shop at the mercado. He says that’s when the veggies are the freshest. Having grown up in a rural community, he likes to pick out the fruit and produce at the farmer’s market and always enjoys talking with the lady vendors. Without fail, he returns home with bags bursting and tells me how much he enjoys these visits with the ladies who compete for his business. 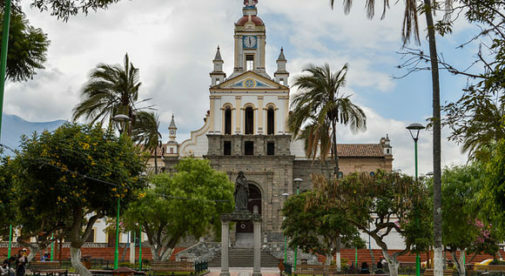 Within our small town there’s diversity of cultures…Mestizos (a mix of indigenous Latin American and European ethnicity), Quichua (indigenous people of Ecuador), and expats from around the world. Our friends of various ethnic backgrounds are a continuous delight. We’ve been invited by our Quichua friends to some exceptional celebrations in their community. These indigenous people work hard to maintain their heritage and you can see it in their eye-catching, traditional dress, the practice of the Quichua language, and generations-old celebrations that include music, dancing and games. Our friends and neighbors appreciate that we like to sample unfamiliar local fruits, vegetables and traditional dishes and frequently bring new dishes for us to taste. Last week our neighbor brought camote which are purple sweet potatoes. Today she turned up with calabaza, a delicious pumpkin. We’ve also been introduced to traditional dishes like fanesca, a heavy stew only eaten during Holy Week. The beauty, honesty, and simplicity of Cotacachi and its people has allowed Susan to grow. I wasn’t sure if I would feel welcome and comfortable living here but in the year-and-a-half we’ve lived in Cotacachi, I’ve never experienced anything but kindness and generosity from the people of this town and as a mature woman I feel I am given more respect here than in the U.S. Taxi drivers and locals ask us where we’re from and if we like living here. They are proud of their home. Their openness and honesty is refreshing and takes a bit of getting used to. It’s necessary to allow extra time walking to town for an appointment since we are frequently involved in friendly conversations along the way. While I agree with Kim about the wonderful people of Cotacachi, what endears me to our home is this amazing setting in the northern Andes Mountains. Being situated near the equator at such a high elevation provides a constant comfortable temperature…and we no longer have to live indoors for six months of the year. The views and scenery in every direction are magnificent. Having been a flatlander for a large part of my life, I find living between two volcanoes hard to believe. It’s astounding to live at 8,000 feet and look up to see a snow-covered mountain peak. Our apartment has an exceptional view of Cotacachi nestled in the valley. With the church in the distance, the scene resembles a picture postcard in the daytime and a glowing Christmas card at night. The beauty, honesty, and simplicity of this place and its people has allowed me to grow. I feel a birthplace is decided by chance…but a place where your soul is at peace is the ultimate personal choice. Living here, my spiritual homelessness is resolved. Kim feels the national treasures here are the people. And, I can’t stop staring out the window at our magnificent surroundings. For our own reasons, we both find gratification living here in Cotatcachi. My advice? Research, investigate, weigh the challenges and the costs. If you feel it’s right for you, make the move…don’t put happiness on hold.